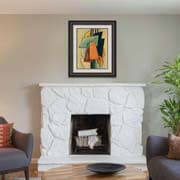 Selecting art for your living room can help to create balance in your space and set the tone for your entire room. 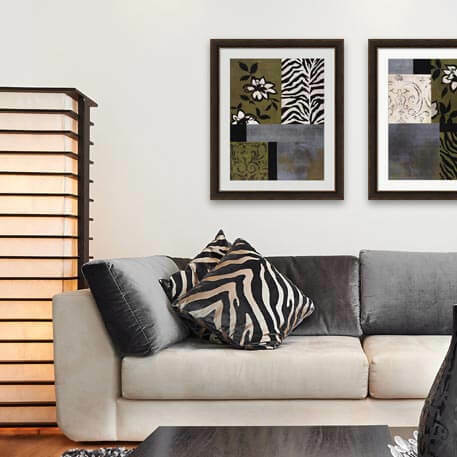 Let our experts at FramedArt.com guide you on how to decorate living room walls with the best placements, styles and colors for your living room in our Living Room Decorating Ideas! 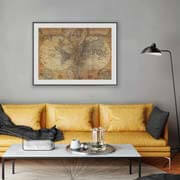 When you're choosing art for your living room, the first thing you want to do is analyze your space and decide where the best place to hang your artwork is. 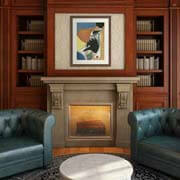 To do this, you should look at the furniture you want to include as well as fixed objects, such as a fireplace. Determine if the current configuration of your room is precisely what you want prior to purchasing any artwork or hanging it up. 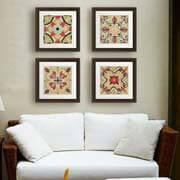 Once you have everything in place, it's time to figure out where a good place to hang art is. Just because you have an empty wall, doesn't mean that that's where you should hang up some art. 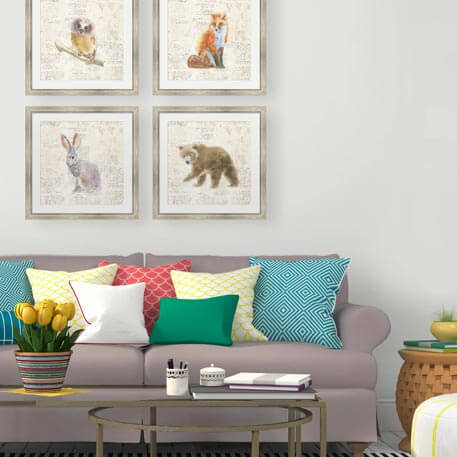 Being selective and thoughtful about where you hang your framed living room art can help to keep your space from getting over cluttered or seem smaller. Having changed the configuration of my living room multiple times, I can tell you from experience that spending the time rearranging your artwork a couple times before hanging it up is worth it! 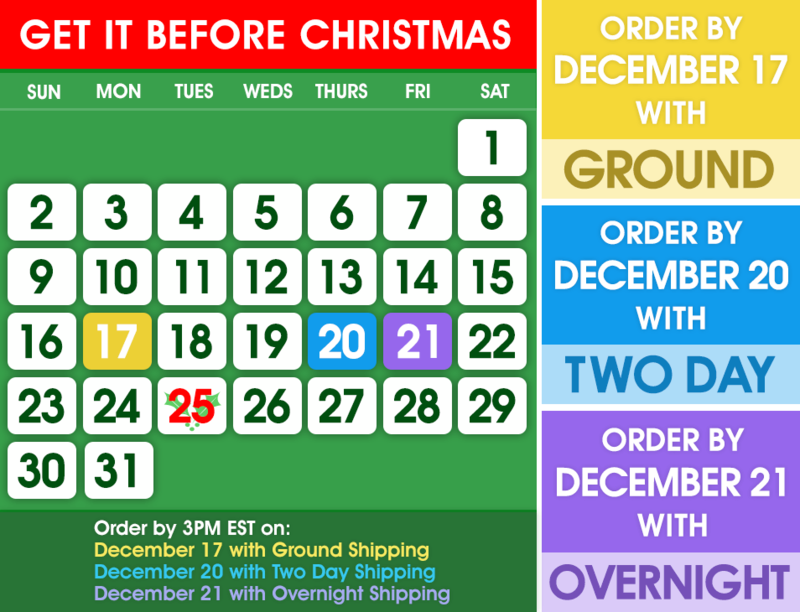 Otherwise, you'll have to spackle multiple holes in your wall when you decide you need to move your furniture and wall art. 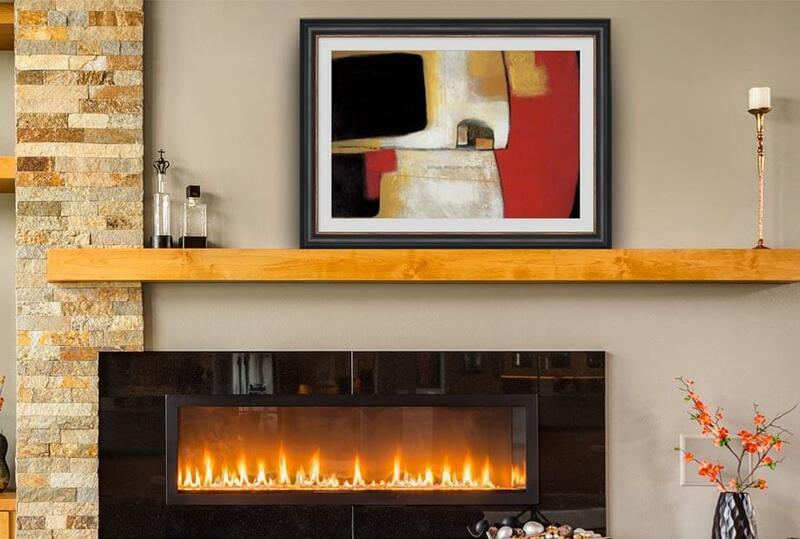 In a living room, most people want to include artwork or a framed mirror over their mantel when deciding how to decorate living room walls. 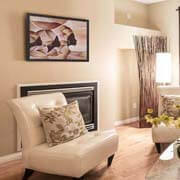 Choosing a custom framed mirror can help to make your space feel larger. 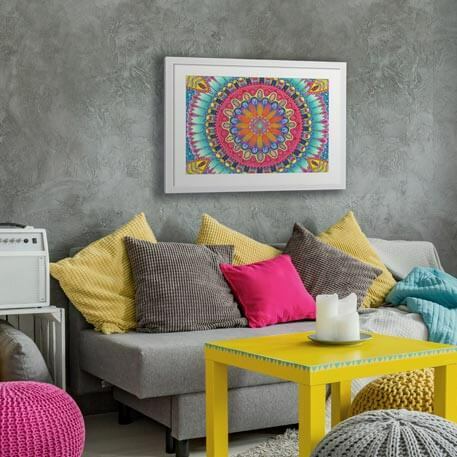 On the other hand, a piece of framed living room artwork can create a focal point in your space while also adding some style to your room. Often, the mantel is the first thing that people see when they walk into your living room so you want to make sure that you select a large, bold piece that will represent and unite your living room's theme and style. 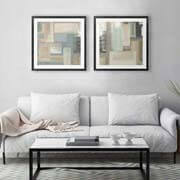 If you select artwork with a more neutral color palette, such as our fresh neutrals or timeless chic collections, it will help to open your space and make it seem larger/brighter. If you're looking for a more bright and bold piece, try bohemian art or bold statement art to really add some flare above your mantel. 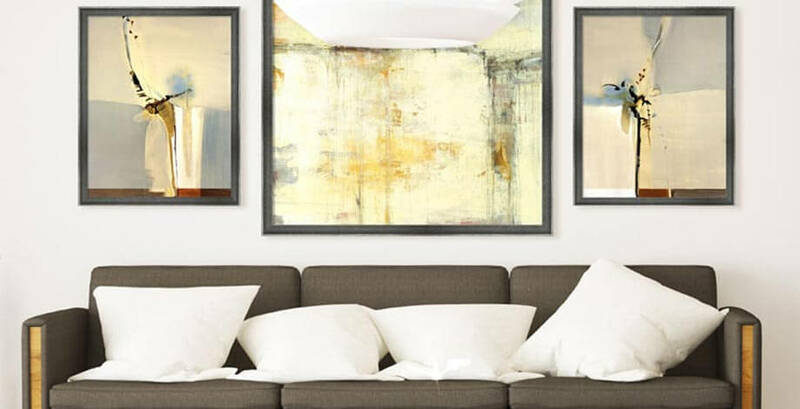 When deciding how to decorate a living room with art, most people already know that living room art is typically hung over a couch since there's a large amount of empty wall space above it. 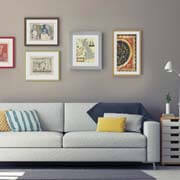 When hanging artwork over a couch, you can choose a series of artwork, a wall gallery or a large piece. 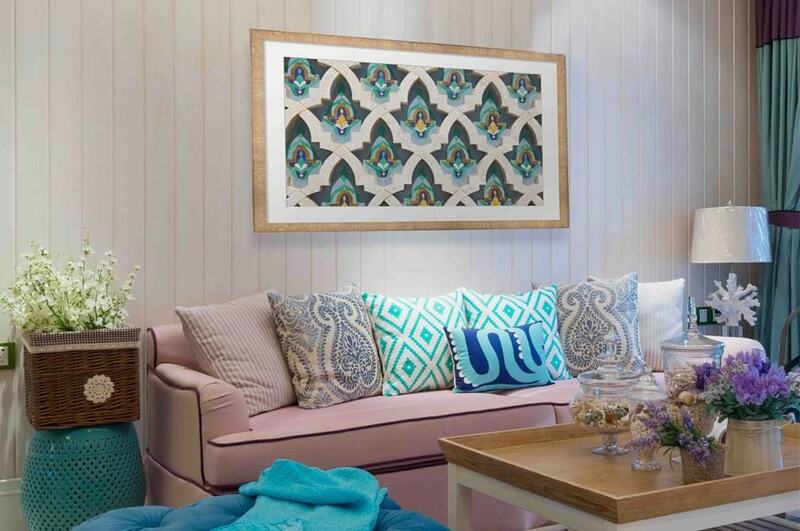 While most homeowners opt for one large piece of artwork, choosing a series or a wall collage of smaller pieces can help to make your space look larger. 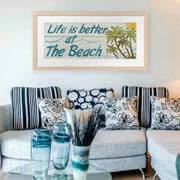 This also allows you to add some extra style to your space that you lose when you're limited to only one piece. 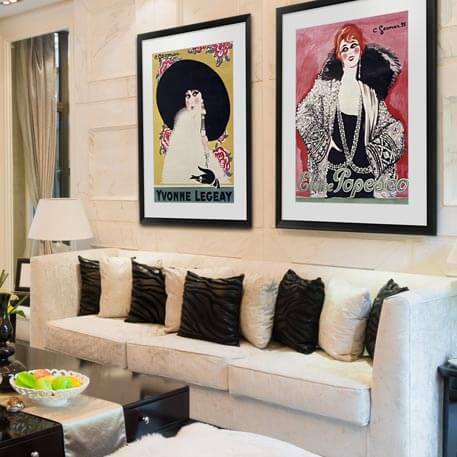 If you're looking for a more eclectic wall gallery, choosing various black and gold glam art is a good way to add a sophisticated modern twist to your room while still keeping the space larger and open. 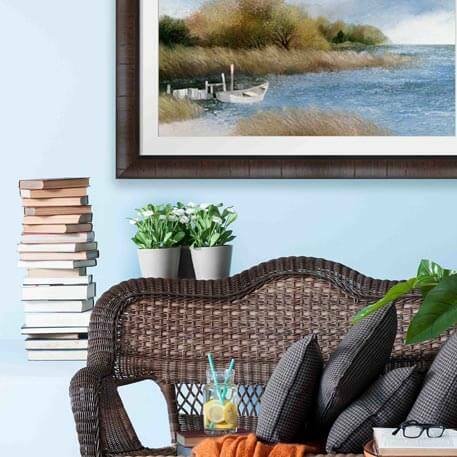 For a more playful, eclectic vibe, try hanging a series or a wall gallery of smaller lakehouse life art above your couch or by a chair to add some flair. 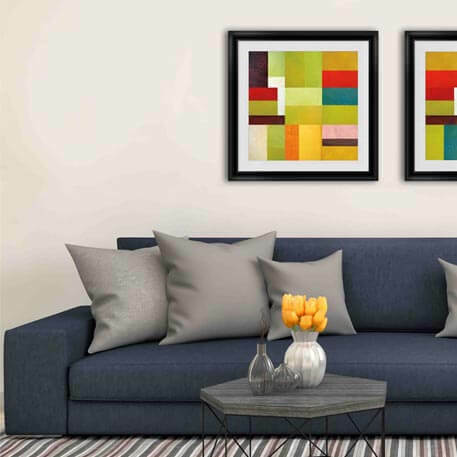 Once you've decided where you want to hang your framed art in your living room, you'll want to select a size that fits properly into that space. 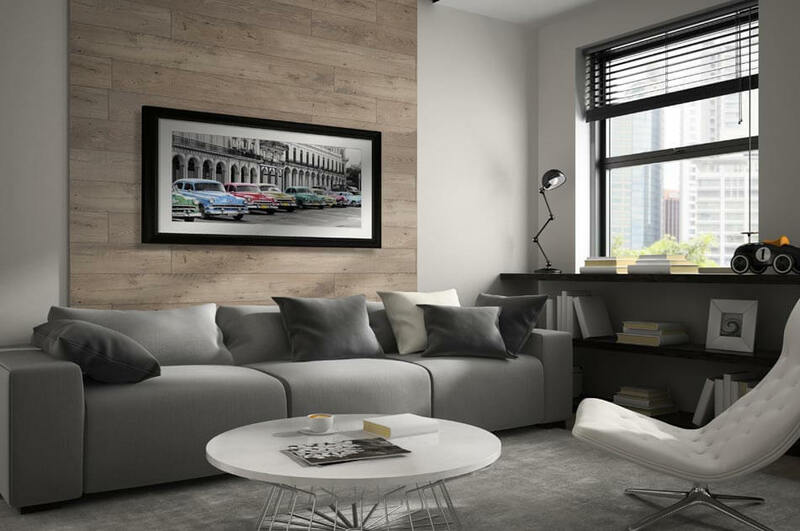 Most people try to use a general rule of thumb to try to figure out what size their artwork should be, such as "leave 6 inches on either side of your wall empty." However, if you have a really large piece of artwork, 6 inches probably isn't enough space on either size to keep your art from overpowering your space. 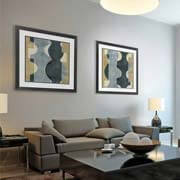 Generally, you want your artwork to take up 2/3 to 3/4 of the space on your wall. So, if your space is 6 feet long (72"), you'll want your artwork to take up a 48-54". If you're creating a wall gallery or using a series, you'll also want to account for space in between each piece as well. Hanging (2) 24" pieces doesn't leave you a lot of room in between the two. 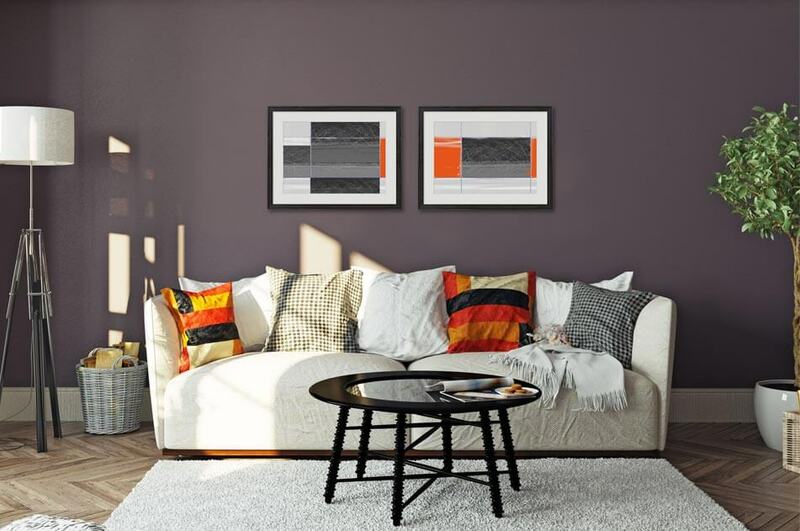 To get a feel for how the artwork will look in the room, try using construction paper cut outs or holding the artwork up to make sure it fits before hanging up your art. This will really help you decide how to decorate your living room. The last thing you'll want to consider when deciding how to decorate living room walls is the current color scheme of the furniture and decor room. 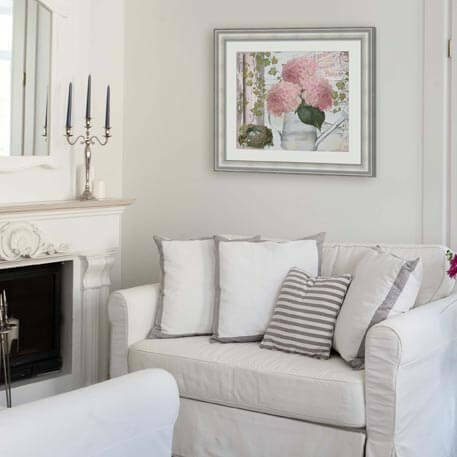 If you have a more neutral, traditional color scheme, you might want to consider looking at Comfy Cottage, Victorian or Transitional artwork. 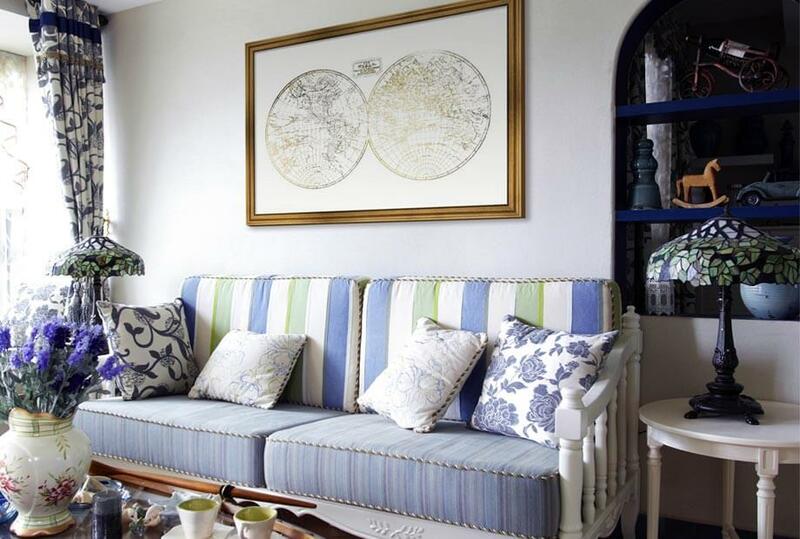 These styles have similar more muted color schemes that will flow with your current decor and help to bring a contemporary (transitional), shabby chic (comfy cottage) or classical (Victorian) style to your room. For a brighter, more playful color scheme, try selecting artwork from our Geometric Lines and Designs, Pop or Color or Bohemian collections. 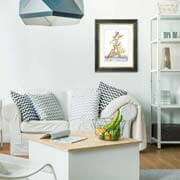 Geometric Lines and Designs offers a more minimalistic, modern vibe reminiscent of Scandinavian, simplistic decor. 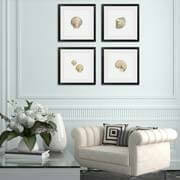 Pop of color adds elegance to a room with its black and white photos or artwork that have a hint of color. 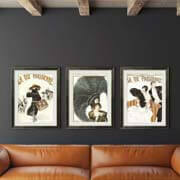 Bohemian artwork, on the other hand, will create an eclectic, playful vibe with a worldly, new-age feel. 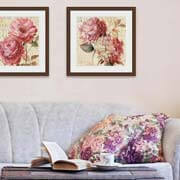 Each is perfect for brighter, bolder colors and modern furniture. If you're looking for a specific style for your living room, we have a wide variety of different decorating ideas to help you find exactly what you're looking for! 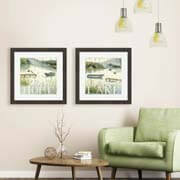 Simply click on one of the links below to start discovering new styles and themes! 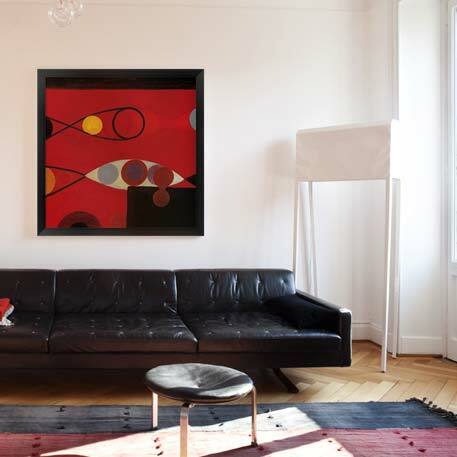 Follow FramedArt .com's board Modern Living Room Art on Pinterest.